As much of a disaster as the Jets' season has looked at various points this season — that's to say, essentially every point but the Bills win — they've yet to truly have a devastating, season-crushing loss. Sure, they looked terrible against Pittsburgh and San Francisco, and were beaten more soundly than everyone was trying to tell themselves against Houston, but those are all top-tier teams. There's no shame in losing to any of them. (Though after the Steelers' loss last night, we're not so sure.) This week, the Jets host Indianapolis. There is shame in losing to Indianapolis. That's not to say Indianapolis is terrible, far from it. They've already won as many games (two) as they did last season, and they've beaten the Vikings and Bears, better teams than the Jets have beaten. They're also clearly inspired by the battle of their coach Chuck Pagano, who is in the hospital battling leukemia. And they have Andrew Luck, perhaps the best quarterback prospect since Peyton Manning, the guy they had last year. The Jets have been looking for a franchise quarterback for nearly four decades, and the Colts just keep having them drop in their laps. Point is: The Colts are no pushovers. But no matter: The Jets absolutely must win this game. A loss to Indianapolis would be their third home loss in three weeks, the week before a treacherous trip to Foxboro. The second half of the Jets' schedule isn't necessarily terrible, but the Jets cannot afford to lose at home to a team that won two games last year. Of course, it seems a bit silly to talk about the schedule, considering all the Jets' other problems. The running game, usually the team's strength, is basically underwater, and the struggles of Mark Sanchez in the passing game are well-documented. The defense played better against Houston, but not that great; it was a bit bewildering how many effort points the Jets got last week for not being blown out at home on national television. So here the Jets are, a win away from 3-3, and a loss away from their season sorta officially be declared a disaster area. The Jets are talking big about their running game, but we can see the defense stepping up again and pulling out a tight, ugly one. 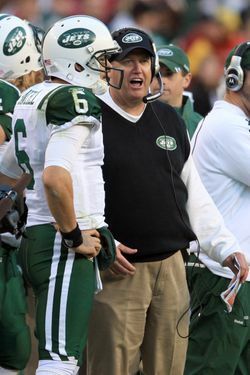 It makes sense: If the Jets lose Sunday, you can pretty much ignore them the rest of the year. And if we know anything about the Jets, we know they want anything but that. Jets 19, Colts 17.